Our palpation cage provides the cattleman with safe and convenient access to the rear of the cow for pregnancy checking or artificial insemination. This important piece comes standard on every squeeze chute and portable handling system we offer. However, customers can also this piece separately as an addition to their current livestock system. 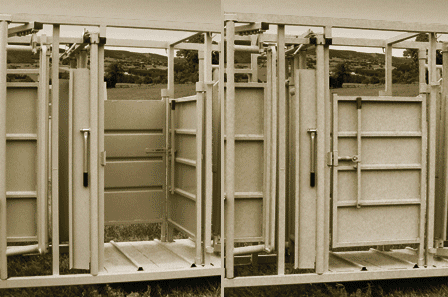 Comes standard on all our squeeze chutes and portable systems. 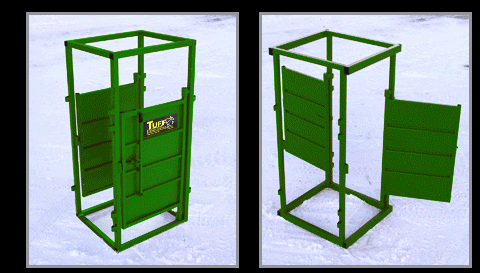 Use for sorting animals or blocking the passage while working on the animal in the chute. Doors open either inward or outward. Dimensions: 36″ L 34″ W 78″ H 150 lbs. Veterinarians care for the health of animals and work to improve public health. They diagnose, treat, and research medical conditions and diseases of pets, livestock, and other animals. Veterinarians prefer to work in safe conditions to optimize the treatment of your animals. Keep your vet safe by offering a palp cage for each AI or PG visit. 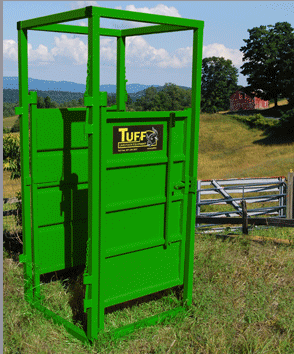 Because cattlemen safety is a priority at Real Tuff, we offer a veterinary discount on our chutes, and portable handling systems. Contact Dave at our sales headquarters to discuss the details! All things considered we believe you and your cattle will be happier using Real Tuff Livestock Equipment. Contact us with questions and to place an .